In the end, AzhwAr says “thirunAdu (spiritual realm) will be at the disposal of those who are experts in this decad”. ALvAr – will rule over to their full desire. nammAzhwAr, the leader of AzhwArthirunagari which is surrounded by garden having blossoming bunches of flower, out of sorrow, blabbered about emperumAn who eliminates the hurdles of enjoyment and is the great wealth which is preserved; he mercifully spoke in this decad which highlights the great urge to attain the goal, amongst the ten centums, about emperumAn who is residing in thirukkOLUr; those who can recite this decad placing their heart into it, will rule over to their full desire, the laudable paramapadham which is having the radiance of bhagavath anubhavam. vaiththa mA nidhiyAm – This is the reason for her lone journey and leaving the mother behind. While the accumulated wealth is already present, who would let it perish and not enjoy it! vaiththa mA nidhi – Here emperumAn is said as nidhi (wealth) due to the following reasons – being the preserved wealth as said in periya thirumozhi 7.10.4 “eyppinil vaippinaik kAsinai maNiyai” (the wealth when one is helpless, the gold and gems), that which makes one hold onto their life when heard about its presence [just as one would get their life back when one accepts the existence of bhagavAn], that which makes everyone fall at the feet of the owner [even the dhEvathAs will fall at the feet of bhAgavathas who have bhagavath bhakthi], that which lets one live off it [when an AchArya teaches about bhagavAn to a Sishya, the Sishya would give offerings], where no one would blame the owner for living off the wealth [no one would blame for accepting such offerings] and would bring great honour [such AchAryas who have great knowledge about bhagavAn are praised greatly], such possessor need not worry about anything [one who has bhagavAn in his heart, need not worry about anything], one can get anything with that [one can get anything with bhagavAn’s presence], and one can enjoy all types of enjoyment with its presence. mAnidhi means highly valued wealth. That is, even after getting everything with it, it remains the same – imperishable. The worldly wealth will perish over time. 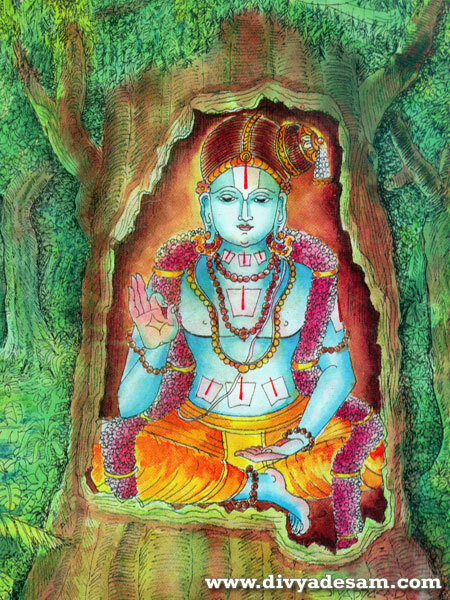 madhusUdhanaiyE alaRRi – madhusUdhana implies he protects himself. The goal itself can eliminate the hurdles and let us enjoy it. koththalar pozhil – As said in SrI rAmAyaNam yudhdha kANdam 127.5 “sarvancha kuSalam gruhE” (everyone is well at home). Just as SrI bharathAzhwAn was having his heart getting closer to perumAL (SrI rAma), the whole of SrI ayOdhyA became green with blossomed flowers realising that he is arriving soon, AzhwArthirunagari too became green with blossomed flowers due to AzhwAr‘s mind acquiring clarity due to his being fully focussed on emperumAn, not having the time to think about the separation anymore. When there is so much urge in here [AzhwAr, AthmA], would there be any shortcoming in facilitating the goal there [bhagavAn]? It changed from the state as said in SrI rAmAyaNam ayOdhyA kANdam 59.5 “apivrukshA:” (the trees withered) to the state as said in SrI rAmAyaNam yudhdha kANdam 127.19 “akAla palinO vrukshA:” (the trees blossomed in non-season). paththu nURRuL ippaththu – Like nectar in the ocean, this decad among the thousand pAsurams. avan sEr … – Placing their heart on thirukkOLUr where he firmly resides. uraippAr – those who recite. thigazh pon ulagu ALvArE – Instead of having one person (mother) calling out and another person (daughter) going alone, they would enter the abode where they can eternally enjoy. Instead of having to travel alone, they would travel towards the distinguished abode, being witnessed by the residents of archirAdhi gathi (the multi layered path which leads to paramapadham). This entry was posted in thiruvAimozhi, thiruvAimozhi 6th centum on April 2, 2018 by Sarathy Thothathri.